Oatmeal is full of many important antioxidants, protein, minerals and vitamins. It has many wonderful benefits to your health due to its powerful healing properties. These benefits include preventing diabetes, heart diseases and fighting against cancer. Also it has been proven to help in weight loss, reduce blood pressure, reduce cholesterol, enhance your immune system, stabilize blood sugar and provides benefits to your skin. Yes, oatmeal is good natural ingredient for some skin issues. If you have any skin problems such as dry, itchy or irritated skin, oatmeal can help. 1. Oatmeal contains B vitamins, which includes vitamins B1, B2, B3, B6 and B9. These vitamins are important for skin cell regeneration. 2. It helps absorb the excess oil on your skin. 3. Oatmeal contains minerals to keep hormonal balance, thus preventing acne and other skin issues. 4. It helps remove dead and dry skin to keep skin clean, thus preventing acne, pimples and blackheads. 5. It provides relief from swelling and redness, due to its anti-inflammatory properties. In treating acne, oatmeal or a combination with other ingredients works effectively. See below for the natural home remedies to treat acne. Rinse using water and pat dry. 1. 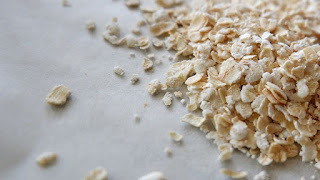 Blend 2 tablespoons of oatmeal until it becomes powder. 2. Combine the powder with 3 tablespoons of water and 1 tablespoon of baking soda to get a paste. 3. Apply the mixture to the affected areas. 4. Leave it on, until it dries. 4. Repeat at least 2-3 times daily to relieve the symptoms. Baking soda helps restore the PH balance of the skin to prevent acne. 1. Combine 2 tablespoons of oatmeal, 1 tablespoon lemon juice and 1 teaspoon of honey. 2. Apply mask on your cleansed neck and face. 3. Massage gently using circular motions. 5. Rinse using warm water. 7. Repeat regularly to get rid of acne. 1. Make a paste using turmeric powder, oatmeal and water. 2. Apply the paste to the affected areas. 3. Leave it on until it dries. 4. Rinse with warm water and regular use it to cure acne. Turmeric helps kill the bacteria that cause acne because of its healing properties. 1. Cook 1/2 cup of oatmeal. 3. Add 1 egg and 1 teaspoon of lemon juice to form a paste. 4. Apply to your skin. 5. Rinse after 10-15 minutes. 6. Repeat 2 times daily for best result. Egg contains an adequate amount of vitamin E, which helps tighten the skin.